Last month, my youngest brother had his last ever academic decathlon meet. 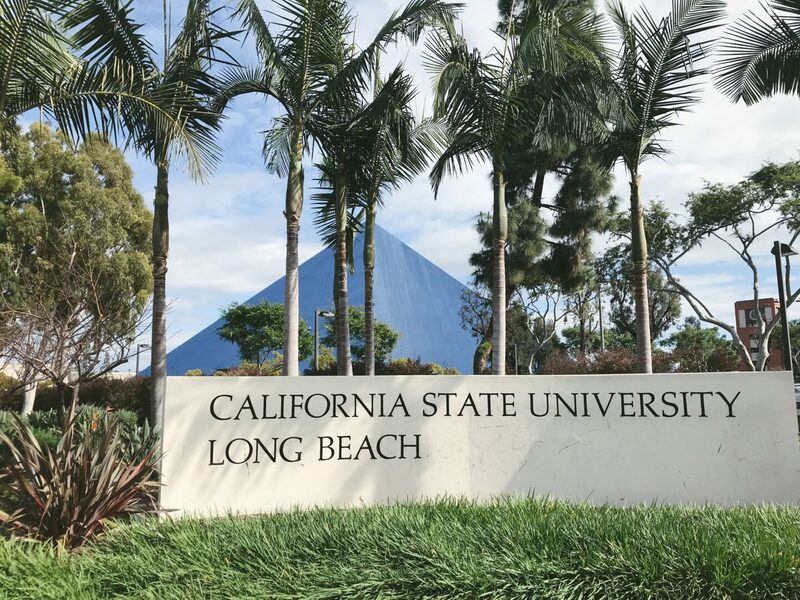 It’s hosted annually in the Walter Pyramid, located at the California State University – Long Beach, and is a full-day event where middle school students test their knowledge. I’ve enjoyed supporting and attending these events, but I’m glad it’s finally come to an end. Waking up at 6am to get this thing rolling can get pretty tiring. My family checked into the Marriott by the Queen Mary so we would have a shorter drive in the morning. Driving to Long Beach was a pain this time around because of the rain and if there’s one thing I’ve learned, California drivers go crazy with some rain. The night before the decathlon, we had a family dinner at Hokkaido Seafood Buffet. This was a monumental buffet for me because I tried crawfish for the first time – like actually peeling it and it was so good. I’ve had crawfish on my sushi before but this was different – an instant love affair. On the day of, my younger brother and I decided to head over to 7-11 for some drinks. We ended up stumbling upon Zero Express, a boba shop, right on the same lot. I got the ube milkshake while my brother got the Thai iced tea; we also bought an cookies n’ cream shake for the youngest one who chose to stay at the pyramid. I had asked for my ube milkshake to have no toppings but the barista forgot and I got this massive drink instead. Don’t get me wrong – it made for a good photo but it was too sweet. Remember how I got obsessed with Roasting Water ever since Nancy mentioned it in her blog? Since they had a store in Long Beach and since I was in the area, I decided to stop by before heading home. I sort of regretted it because I waited in line for 20 minutes (note to self: they are busy on weekends) but the drink was worth it. Their #SWAG drink is something everyone needs to try at least once in their life! I had planned on writing more about the decathlon but the food took over. Sorry not sorry – but let’s be real, I have no consent to post about school-related matters online, especially when it’s not my school. Hope this post didn’t make you too hungry! Oooh! I actually haven’t been to CSULB’s pyramid yet! Pretty cool that you got to support students at acadeca! OH YES!!! I can totally relate about Cali drivers LOL. Shh, I stayed at a hotel when I was in Seal Beach so I totally understand the commute! Zero Express has been kicking up their aesthetic game lately! I had something similar in Monterey Park and it tasted like diabeetus @___@. BUT STILL PRETTY THO. YESSSSSSS ROASTING WATER! That is life!!!! UGH I remember walking out once because the line was ridic but the bottle is worth it!!! That marshmallow! And the Roasting Water bottle! So cute. Wow, these photos are so beautiful! Thanks for sharing! Those shakes look amazing! I want ice cream now and it’s only 6 in the morning! It quite made me hungry though lol! Those milk shakes look super delish, omg. Would love to try one of these. The toppings on that milkshake is intense!! Wow. Even though it looks so pretty, I probably wouldn’t be able to finish it as well with how sweet it’s gonna be. I am now definitely hungry after reading your post and seeing your photos! It makes me want to jump on a plane and fly to California. I would love to try Roasting Water as I have never heard of it until now. 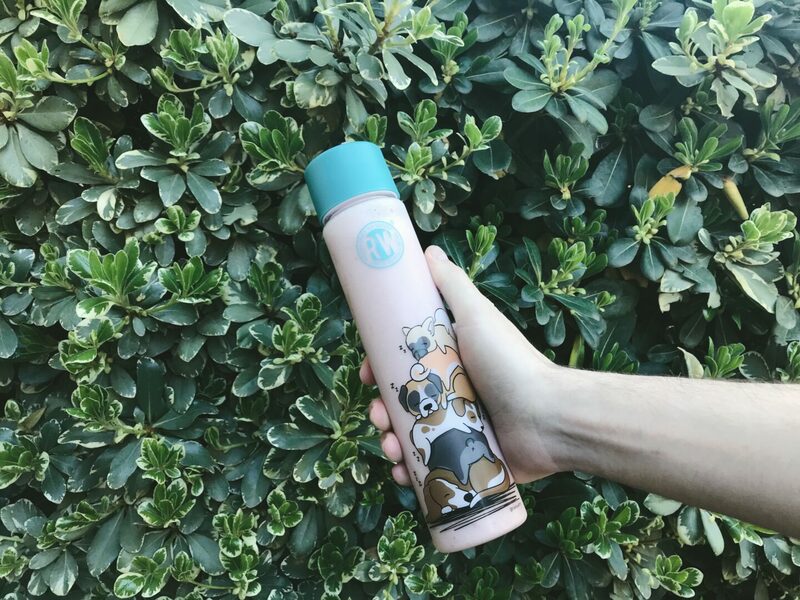 The bottle looks cool! Ohhhhhh that seafood buffet 😋 I don’t blame you for letting the food take over this post, your photos are making me really hungry! Loveee your photos! This looked like a lovely day, thanks for sharing!! you’re making me so hungry right now and i haven’t eaten breakfast yet so that makes it worse. hahaha. 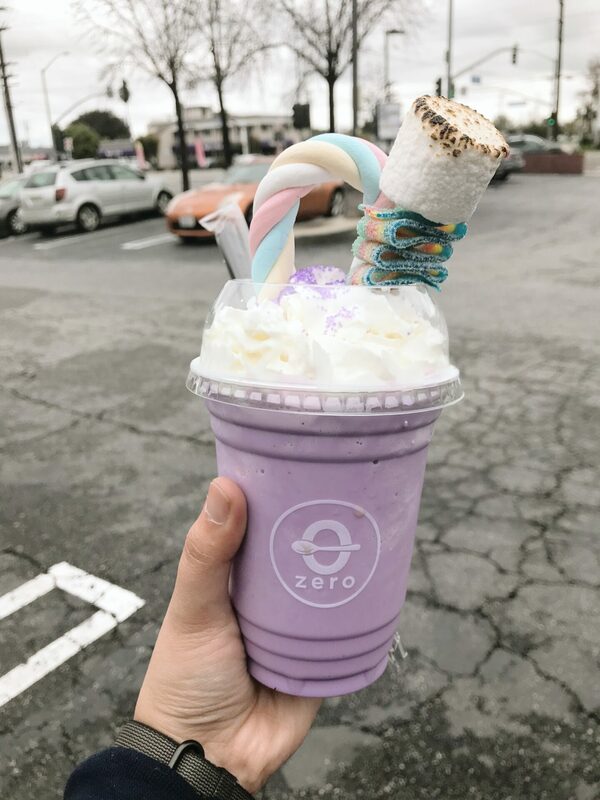 The ube milkshake looks INCREDIBLE! Looks like he heard the opposite of what you asked for haha. That purple milkshake looks so cool!! I absolutely love seafood so a seafood buffet would be right up my street! My mouth is watering just thinking about it! Oh my gosh! I’m dying over here!!!! 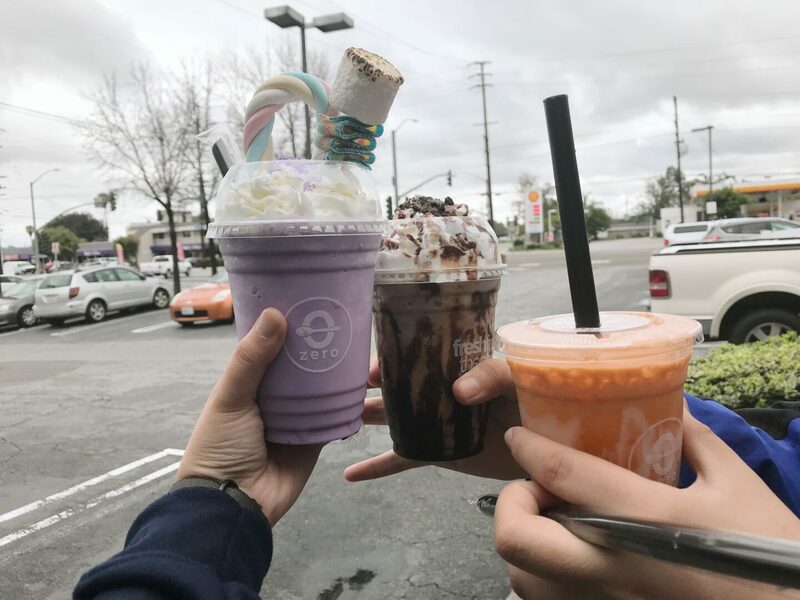 Those drinks especially look amazing…wowwwww talk about Instagram quality food! Yumyumyum! Omg that milkshake thing looks incredible!!!! WOW! Omg the food looks so good!! Food fairs are my absolute favorite! Making me hungry right here with these food shots. Sounds like a good day spent. That’s so amazing you were able to come along on the trip!! aaaaand now I’m hungry after looking at these pictures, ha! Wow that Zero Express looks like heaven! I’ve never been to California so I’ll remember that if I ever go. Those Zero drinks look amazing, I really need to try one! That drink looks awesome . My daughter would love it. Okay, I need to get myself over to Long Beach, if only for that drink! I can imagine it was far too sweet, but it looks SO nice–and of course, Instagram worthy. Nevermind the fact that I live on the other side of the world of anything, haha! Ohhhhh boba is my favorite! Our favorite Vietnamese restaurant in Boulder has watermelon boba and it’s one of my favorite drinks in the world. That is an EPIC drink right there! You always find these incredible drink spots and I want to try them ALL. At least the food made up for the early mornings! OMG Zero Express look so good! Those look incredible! I’ve never had crawfish before, but I’m actually curious as to what it tastes like. That Zero Express place sounds awesome. Those look like yummy treats, and I love the marshmallows on the one. Oh my gosh! That milkshake looks incredible! Such a pretty colour! It’s a shame it was too sweet though. I don’t think I’ve tried crawfish before but I’d definitely be willing to give it a go though! I love seafood! Woot for supporting events like the one you attended, but no woot for waking up so early! I had to giggle since crawfish and Hokkaido just doesn’t go together in my head. I am glad you had a good meal there! Zero Express looks yummy! That ube drink topping is definitely massive!!! It looks pretty, though And yassss! Roasting Water! You and Nancy are both making me want to check it out if I am ever in Cali! I hope your brother had fun at the decathlon – I’ve not heard of it before, what sort of knowledge do they test? Is it like general knowledge or stuff they were taught at school? I am so hungry now!! Those shakes are now on my bucket list! The Hokkaido Seafood Buffet and the Zero Express milkshakes look absolutely incredible. Your photo’s are amazing. Those drinks look so delicious and also very photogenic! Yes to crayfish! And that ube milkshake is intense, I guess the topping is worth it you have made us drool over it haha. That’s one heck of a food trip!!! I’m actually disappointed that I didn’t know this was happening because it looks like it was so awesome! I’d never heard of Roasting Water before…time to check it out! Oh my goodness those drinks look amazing! Especially with the marshmallows! Wow! Beautiful photos! Haha wait you’re trying to tell me you DIDN’T want those toppings?! It looks soooo goood! Those are really lovely pics.